This event is static (we can't give Ride and Drives) but we know that and provide the education that we can while we are there. It provides us a large captive audience in fans coming to see the football game. 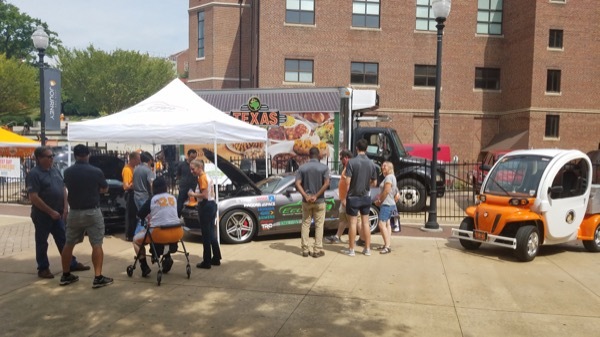 We had many conversations with football fans, students and others about EVs, about the UTK EcoCAR3 program, and about EV charging in and around campus. Before the masses arrived, UTK EcoCAR 3 Program students and faculty and ETCleanFuels staff talk with some early arriving football fans. For the 4th year in a row, ETCleanFuels will be partnering with the Univ. of Tennessee at Knoxville and its EcoCAR 3 Program to showcase their entry in the 4-year national EcoCAR 3 competition. We will be situated right outside the large Gate 21 area, and will have a booth with lots of information, their gorgeous, modified Chevrolet Camaro, another EV or two and plenty of Volunteer Spirit! There will not be a Ride-n-Drive as we don't have that capacity where we are located, but we love to let people sit in, plug-in and learn more about UTK's involvements in the national EcoCAR 3 Program and plug-in electric vehicles in general. Additionally, while we welcome EV enthusiasts to come say Hi and/or help us reach out to attendees (this game is against in-state rival East TN State Univ., ETSU), we don't have the ability for you to bring your EV - we are allowed limited parking near Gate 21, and that area is heavily policed. Our intent with the event is to directly reach attendees who may not be thinking about an EV as a future purchase and get them closer to joining the ranks of those who WILL be buying an EV for the next car! Registered attendees report 135,418 electric miles driven.